Towner styles itself “the contemporary art museum for South East England.” Towner is free to enter, and presents major exhibitions of UK and international contemporary art, and has a renowned collection of art from across the ages. Towner aims to put the visitor at the heart of what they do. Friendly and knowledgeable Gallery Assistants love to engage in stimulating conversation. Towner’s learning and participation programmes are recognised as some of the best in the UK – and can often be seen within the gallery. The architecture of the new building is award-winning and has the largest display space in South East England. The café-bar has stunning views over the South Downs. Towner is a partner in the Plus Tate scheme, through which they contribute to a nationwide exchange of ideas in the visual arts. Towner’s Art Fund International award helps them remain at the forefront of international contemporary art collecting. Free gallery tours at 11.30am daily and events for all ages. On a weekend or school holiday, drop in to the Art Box activity space to create some art of your own (subject to room availability). 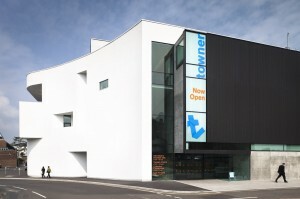 Towner is part of Eastbourne Borough Council and is a regularly funded organisation of Arts Council England. Towner membership is open to all. via Our story | Towner. This entry was posted on December 27, 2013 by braveadmin in All Venues, East Sussex (inc Eastbourne & Hastings), Towner Contemporary Art and tagged art, East Sussex (inc Eastbourne & Hastings), Gallery, Towner.